All three of those things were completely redefined after my shoot with Danielle and Jeff at Loch March Golf & Country Club last night. Although some would say it was a chilly, cloudy night last night, I thought the cloudy skies were absolute perfection. Clouds really are a photographer's dream. Next up: a nice location. Loch March was a stunning location to work with...the pathways were perfectly dusted with leaves, beautiful wrought iron gates, black street lamps, and quaint stone walls and pillars. Finally: fun subjects. 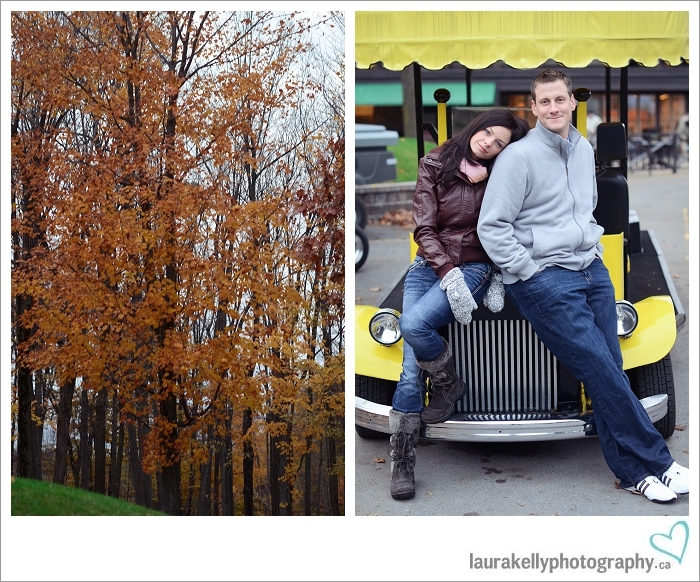 Danielle and Jeff were an absolute blast to photograph. Most of the time Jeff would ask her, "what are you laughing at?" and she would just laugh more. Does it get any easier? I'm also a sucker for mittens, so Danielle had already won me over when she stepped out of her Jeep. Get ready to see a LOT of photos of these two because I had a seriously difficult time narrowing it down. Hopefully you'll see why!). Danielle, you're drop dead gorgeous! That last photo sums it up perfectly, with Danielle laughing hysterically in the background. This is where the shoot started getting so cute I couldn't handle it. Who's a model? Oh right.